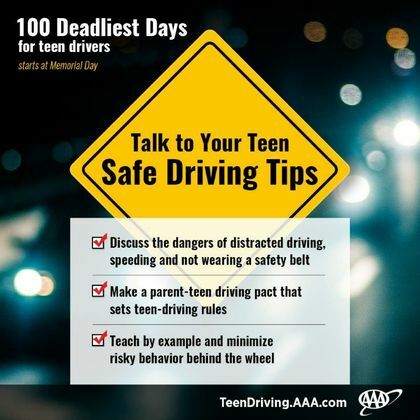 AAA is releasing alarming new research as the “100 Deadliest Days” begin, the period between Memorial Day and Labor Day when the average number of deadly teen driver crashes climb 15 percent compared to the rest of the year. Over the past five years, more than 1,600 people were killed in crashes involving inexperienced teen drivers during this deadly period. Distraction: plays a role in nearly six out of 10 teen crashes, four times as many as official estimates based on police reports. The top distractions for teens include talking to other passengers in the vehicle and interacting with a smart phone.